Life of a Catholic Librarian: "Wait, what day is it?!" Publicly losing one's mind, but hey, 54 day rosary novena to look forward to! "Wait, what day is it?!" Publicly losing one's mind, but hey, 54 day rosary novena to look forward to! Hi all! I meant to blog yesterday. I really did. But the day just...got away from me. I had two classes (the first of which was incredibly awkward owing to the fact that the majority of the class appeared half dead. I had to *physically wake up* 2 of them before the lecture even started, that's what we were working with here :0), plus Pilates at lunchtime, plus a bunch of student emails to answer and send out, and before I knew it, I was home frantically pouring a glass of wine to unwind and I realized that I hadn't blogged. Though I had meant to. D'oh. Want to know what else that I forgot? 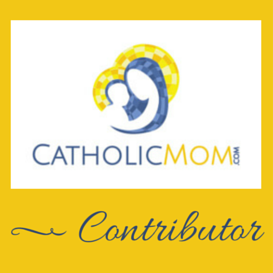 That I had a piece come out with Catholic Mom yesterday. :0 I'm telling you, things are a BLUR for me right now, it's quite epic. That's not necessarily a good thing, but it is what it is. I'm taking one day at a time, and it's been going much better. In the meantime, click on the graphic below to follow me over to Catholic Mom to discuss...54 day rosary novenas! After a long day of teaching yesterday, I was super pleased to see that someone tweeted about my Catholic Mom piece. That's what reminded me that it existed. ;-) Then I had someone write to me that they were thinking of praying a 54 day rosary novena, and that my article pushed her over the prayer edge to do it. This made my whole evening. SOOOOO, if you'd like to pray along, we're starting November 1st, the feast of All Saints! This means that we'll finish up on Christmas. I mean, how PERFECT, right?! I'll bookmark a page at the top of the blog with all of the details when I get a chance, but let's do this thing!! Who's in for a 54 day rosary novena?! We must be in tune - my blog post today was also titled Wait - What Day Is It? Positive thoughts for serenity coming your way. BTW - I love your blog and Tea w/ Tiffany. I'm a new Catholic and always hear or read something I need to hear from you. Thanks and keep 'em coming! Hi Beth! Solidarity, sister. <3 So glad to have you here! Let me know when you put up the book-mark. I'll try to participate, although I can't promise that my sleep-deprived, over-worked self won't forget. It's about intention, right?